On Tuesday evening, F and I joined C and J at the England vs. Germany International Friendly soccer (football, here/anywhere but the USA) match at Wembley Stadium. Neither F nor I follow football closely, but I always enjoy watching the EuroCup and World Cup. Plus, since Germany was playing in the match we were sold on going. Wembley is also such an iconic stadium — apparently the second biggest in Europe, holding 90,000 people (though “only” 85,000-something attended this match). After huddling around in the brisk temperatures for a drink and some chips (fries) outside the stadium, we climbed up to Row 30 of Block 504. Despite being six rows from the top of the stadium, the view was actually really good. I had anticipated the players looking like ants, but we could see the whole field, the players, and the ball quite well. There doesn’t seem to be a bad seat in Wembley, in part because the seating is so steeply pitched that you can see over everyone in front of you. The match itself was not thrilling, though F and I were happy Germany won, 1-0 (we had to cheer quietly, since we were sitting in the English section). Overall the play was a bit slow and Germany was definitely playing most of their second team, though their passing was still amazingly quick and accurate — one of my favorite parts of the game. One long cross by a German player landed perfectly at his teammate’s feet without the teammate having moved a step…wow. Neither team had a sense of urgency, though, maybe because it was a “friendly” and so the result didn’t really matter (except for “national pride,” as J pointed out). The Guardian published an accurate match report that I’ll let you read for the details. It was fun to escape routine on a Tuesday night! It took us ages to get home with the other 85,000 people, but it was worth it for the adventure and the company. This entry was posted in community, culture, exercise, Highlights, pictures and tagged football, Germany, soccer on 22.11.2013 by taplatt. Disclaimer: This recipe was not actually made in Ukraine. It was made in Germany at my boyfriend’s WG, which has a working oven. So maybe it’s cheating a little but it was so delicious that I had to share it. This summer salad is a combination of two smitten kitchen recipes: this one and this one. Both looked so good to my boyfriend and me that we thought about how the flavors would go together, decided they would work well, and so we combined the two recipes into one delicious dish. Despite having to roast the carrots and make the croutons, overall it is a pretty quick and hands-off recipe. Preheat the oven to 200C ~ 400F. While the oven heats, chop the carrots and mix them with olive oil, salt, and freshly-ground cumin and pepper. Bake in the oven for 20-30′ or until the carrots are soft but not mushy. Cube the baguette and put the cubes in a large bowl. Add the minced onion and garlic. Use your hands to mix in a generous amount of olive oil along with the parmesan, salt, and pepper. Spread the bread cubes on a cookie sheet and bake in the oven for about 15′ or until they are golden-brown and crispy to your taste. The croutons will finish baking before the carrots. 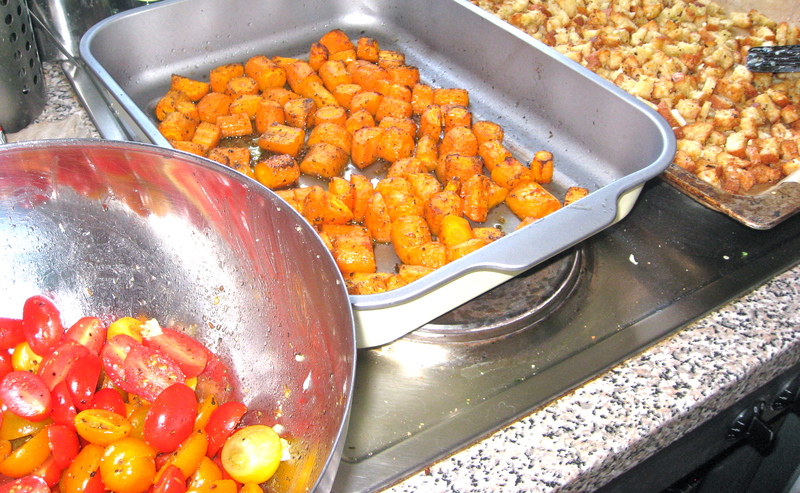 When the croutons are done, take them out and turn up the oven to ~230C for an extra 10-15′ for the carrots. 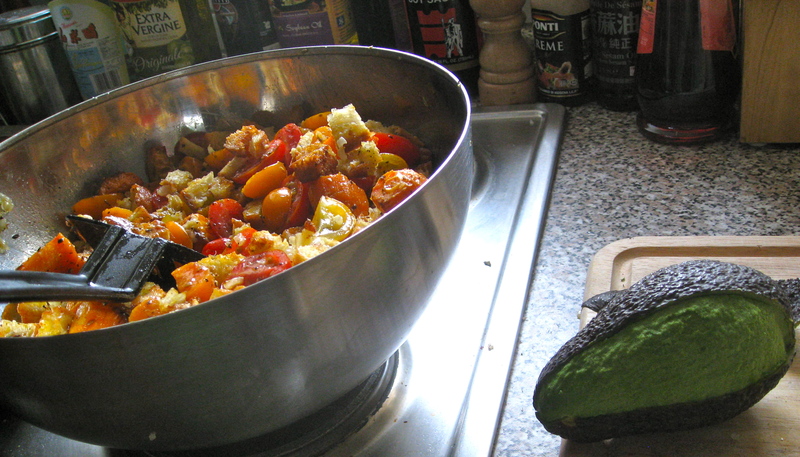 While the croutons and carrots are baking, cut up the tomatoes and avocado and mix them with olive oil, lime juice, and some extra cumin, pepper, and salt in an large bowl. When the baked items are finished, add them to the bowl. Toss and serve warm or at room temperature. This entry was posted in food, health, pictures, recipes and tagged Germany, salad on 18.08.2012 by taplatt.